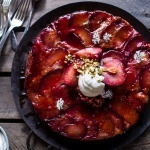 This cake? I basically broke all the rules with this cake. And by rules, I really only mean one. And it’s not really a rule, just more of a principle I like to follow. Normally I am opposed to food coloring and peeps, but this cake. Well, this cake totally got the better of me and even though it’s not something I would make every day, it’s crazy fun (and oh my gosh, so good). Sometimes you just have to let your guard down a little, right? Here is the thing, Peeps are not a candy I would ever choose, especially over say chocolate. They’re just not my favorite, BUT every year come Easter I just have to buy them. My mom used to put them in our Easter baskets growing up, and for me, it’s just not Easter without Peeps. Plus, I love their pastel colors. They make me happy just looking at them. Kind of like the way flowers make me happy, but with Peeps I get a sugar high. Awesome. Let me just start by telling you, there were no Peeps harmed in the making of this cake. Well, Asher ate a few of their ears off, so I guess there were a few. 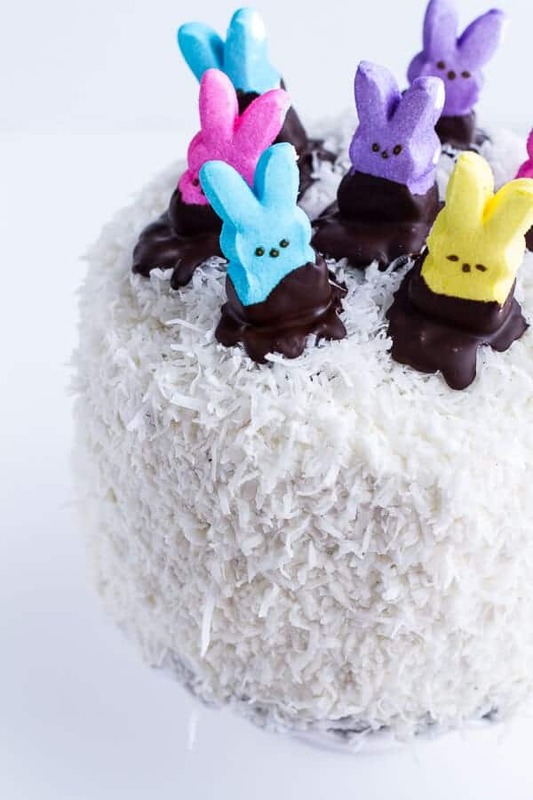 But there are not actually Peeps IN the cake, just on top. The cake is all chocolate, with the most amazing marshmallow buttercream, ganache and a little coconut caramel because well, why the heck not. Plus, there is coconut all over the outside, but that’s pretty obvious. Also, if food coloring is not for you, I get it. For some reason though I could not resist. Maybe it’s because it has snowed all week and I am in desperate need of color. Yup, I blame the snow. For everything. With all that said, I love this cake. I know it is nowhere near perfect, but I am not even close to being a cake maker. Actually, this was my first ever six layer cake. And the thought of making it made me anxious for days, but I did and I am so happy! Sure, the layers are not even, and the slices did not come out super clean – as I had hoped they would. At first (and up until about a minute ago) I was so not ok with that. I wanted so badly for this cake to be beautiful, perfect and professional looking. It’s the perfectionist in me. I had to be convinced to even post the photos. But now, as I write this, I am realizing that it is the imperfections that make this cake real. It’s a cake that anyone can make (preferably someone with patience and a steady hand though). So I guess I am sort of ok with it. Maybe with time and a few more years of baking cakes on my shoulders I’ll get better, but this will do for now. What matters most is the taste, and trust me, immediately after the last shot was taken. Piece after piece was devoured as a little afternoon delight. And since we are being honest here, I have to tell you that this piece you see above, it was my fourth cut. Meaning I cut two pieces out of one side, turned the cake to the other side and cut out two more. I needed the perfect cut. Then the cake looked really weird. Basically cuts all over. I never got that perfect cut I was looking for. Good thing no one in my house would ever care. They just want cake. In any way it way, shape or form they can get it. Mashed up, messed up – whatever…just so it tastes good. 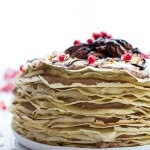 If six layers is a little beyond your time scope, you can make things so much easier by just doing a three layer cake. Truthfully, if I was not trying to challenge myself and do newish things for you guys I would have just made a three layer cake too. Not gonna lie, six layers are a process. Nothing super hard, just a process, and you’re gonna need time. Other than the layers everything else is pretty easy. There are a decent amount of steps, so I recommend making the cake over the course of two days. It just made things easier and less daunting. And don’t get freaked by the steps. The cake is too good not to make. Marshmallows, chocolate, ganache, caramel, COCONUT. Yum! 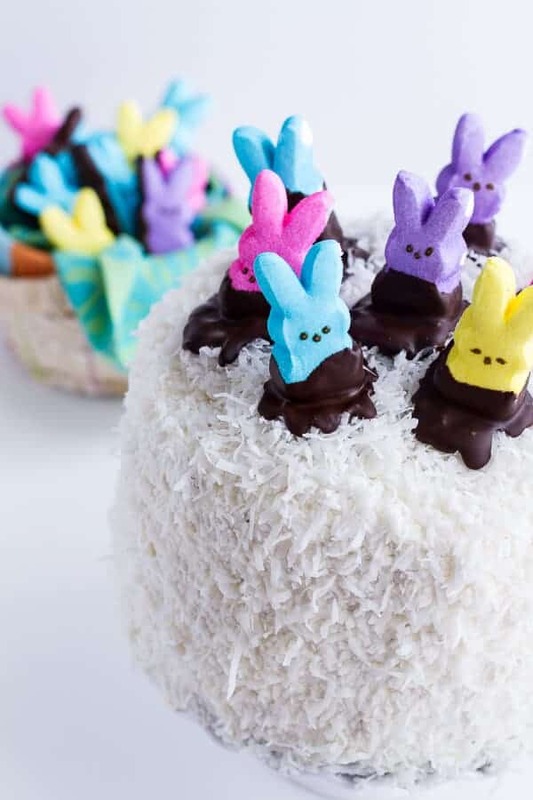 6-Layer Coconut Chocolate Covered Peeps Cake. *I recommend making this cake in steps. Bake the cake and make the Marshmallow Meringue Buttercream on day one. On day two make the caramel and ganache. Be sure to make sure that the caramel and ganache have cooled to room temp. before assembling the cake. *If you like a lot of frosting double the Marshmallow Meringue Buttercream. *Marshmallow Meringue Buttercream adapted from Sweetapolita. *The Marshmallow Meringue Buttercream can be made ahead and kept in an airtight container at room temperature for up to 1 day, refrigerated for up to 1 week. 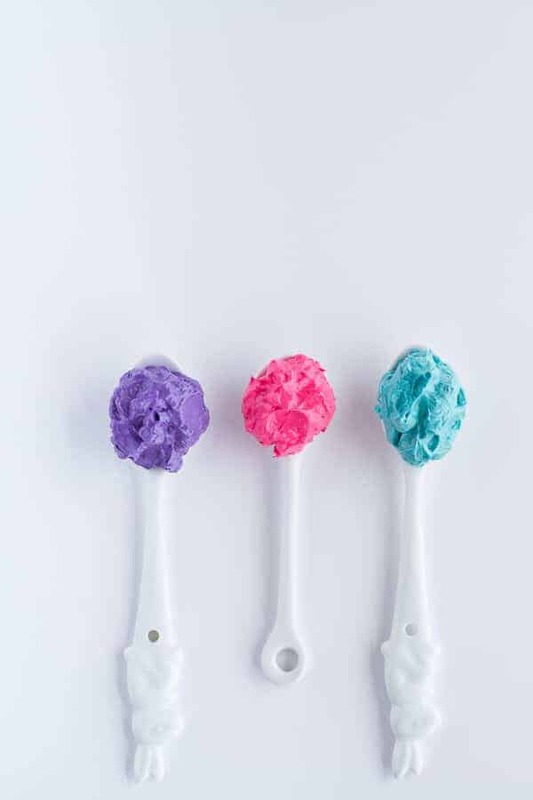 Bring chilled buttercream back to smooth consistency by bringing to room temperature and then beating on low speed with an electric mixer for a few minutes. In a medium size bowl combine the flour, sugar, unsweetened cocoa powder, baking soda, baking powder and salt. Set aside. In the bowl of a stand mixer (or use a hand held mixer) beat together the eggs, buttermilk, greek yogurt, canola oil and vanilla until smooth. Slowly add the dry ingredients to the wet ingredients with the mixer on low until there are no longer any clumps of flour. Add the hot coffee and mix until combined. Batter should be pourable, but not super thin. 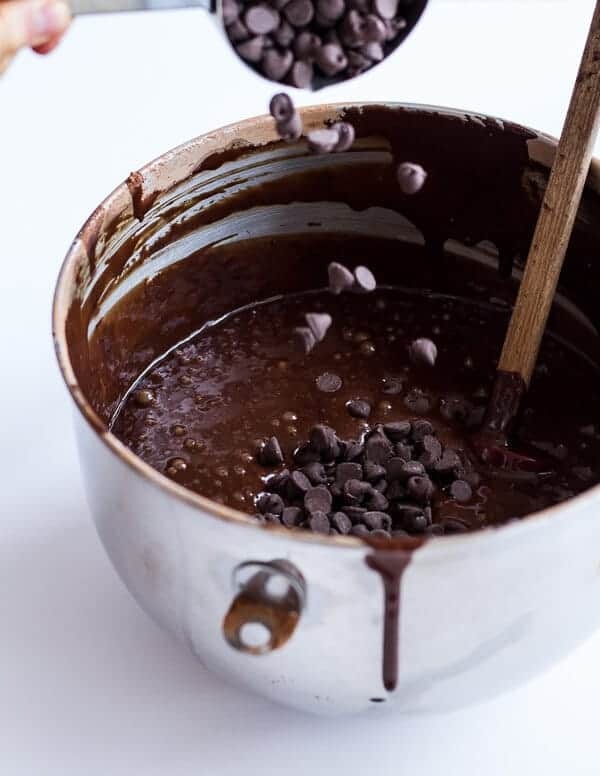 Stir in the chocolate chips, if using. Pour the batter among the 3 cake pans and bake 20 to 25 minutes, until the tops are just set and no longer wiggly in the center. Remove and let cool five minutes, then run a knife around the edges of the pan. Grab 2 large flat plates, line them with wax or parchment paper and invert the cakes onto the paper lined plates. Cover and let the cakes cool completely before slicing + frosting. In a microwave safe bowl add the chocolate, coconut milk (or heavy cream), and instant coffee (if using). Microwave on high for 30 second intervals, stirring between each until melted. Once melted stir in the vanilla extract. Set aside to cool and thicken. Add the coconut milk and and brown sugar to a medium size sauce pot set over medium high heat. Bring the mixture to a boil and then reduce the heat and simmer five minutes. Remove from the heat and stir in the vanilla and good pinch of salt. Set a side to cool. Bring a pot of water to a simmer. Make sure to choose a pot that will allow your mixing bowl to sit on top. Drizzle the bowl and whisk of an electric mixer with lemon juice and then wipe clean with a paper towel, to remove any trace of grease. 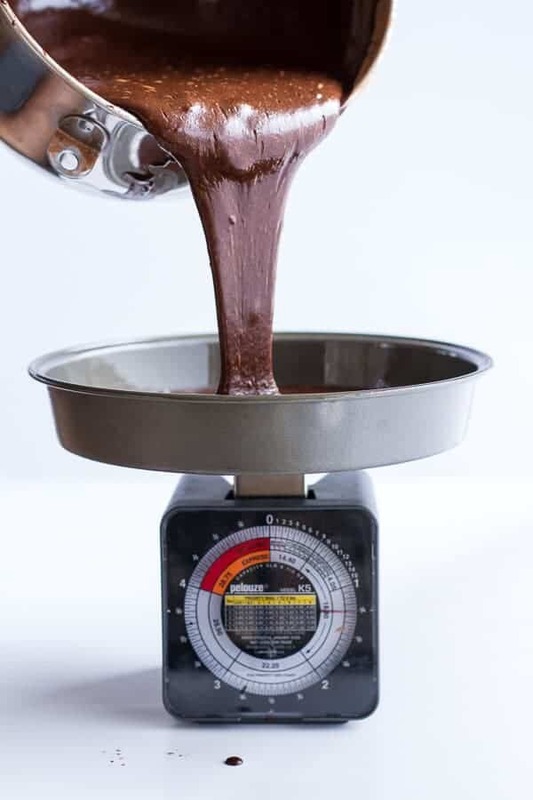 Add egg whites and sugar, and place on top of the pot of simmering water (not boiling), whisking constantly, until temperature reaches 130 degrees F, or if you don't have a candy thermometer, until the sugar has completely dissolved and the egg whites are hot, about 8-10 minutes. Place the bowl back on the mixer and fit with the whisk attachment. Whip on medium-high speed until the meringue is thick, glossy, and the bottom of the bowl is no longer hot, about 5-8 minutes. Switch to the paddle attachment and, with mixer on low speed, add softened butter in chunks until incorporated. Continue to mix until the meringue has reached a silky smooth texture. Increase speed to medium and beat until the mixture becomes thick and fluffy, about 2 minutes. Add the vanilla bean seeds, coconut extract and salt, continuing to beat on low speed until well combined. Slice all three cake layers in half horizontally, so you have a total of 6 cake layers. Or make a 3 layer cake instead. Smear a small dollop of the ganache on a cake plate. Place your first layer cut side up (so bottom of the cake layer is touching plate) on top of the ganache. Drizzle the layer with caramel and then spread about 3/4 cup buttercream frosting over the caramel. Add the second cake layer and repeat with a drizzle of caramel and buttercream. Add the third cake layer and spread the ganache over top. Add the middle layer of buttercream and then carefully spread another layer of ganache over the middle layer of buttercream. Add the forth cake layer, drizzle with caramel and then spread with buttercream. Add the fifth cake layer, drizzle with caramel and add the final layer of buttercream. Add the sixth cake layer. Spread the top of the cake with the remaining ganache (or as much of it as you would like). *To make only three layers skip cutting the cakes and do a layer of buttercream, ganache and then buttercream. Frost the entire cake with the remaining Marshmallow Meringue Buttercream. 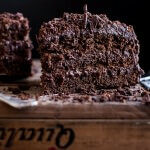 Carefully push handfuls of shredded coconut all over the sides of the cake and on top. Spoon a few dollops of melted chocolate on top of the cake. Dip the peeps into the remaining melted chocolate and then place the peeps onto the dollops of chocolate. If needed stick a toothpick down the middle of peep to hold it in place. Allow the chocolate to harden by leaving it out or placing in the fridge. Cake can be kept at room temperature for up to for 12 hours, but keep refrigerated if longer than 12 hours. Serve at room temperature. This cake is so cute and so awesome-looking at the same time! 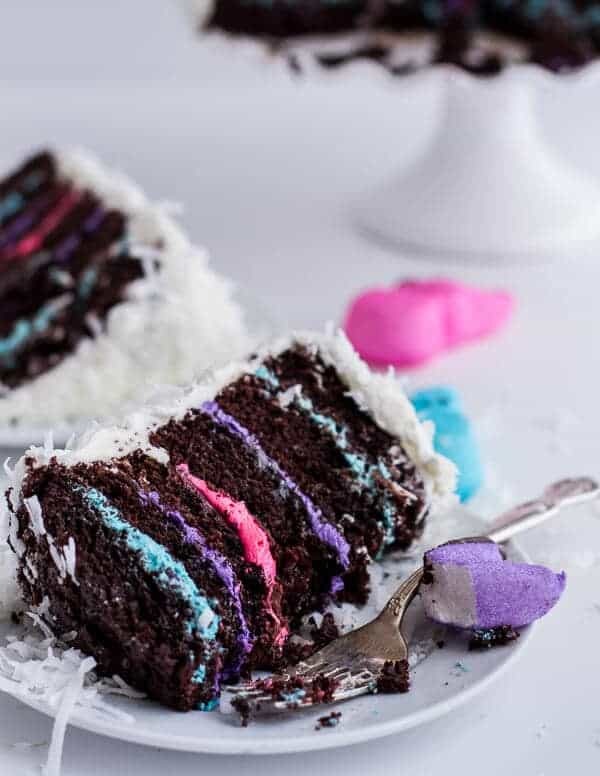 I LOVE the contrast of the neon frosting with the dark cake! Also, this cake looks better than 90% of “professional” cakes I see, just FYI. Thank you so much, Rachael! It means a lot! Honestly, I think they would even taste better!! WoW! so very cute. I could never bake such a cake, but it’s….just great! Nothing wrong with the pictures at all. I don’t think it is possible to slice a 6 layer cake to look perfectly smooth unless maybe a dry cake would, HA!!! As long as it’s a good cake that’s all that counts. All I can say is “OH MY!” This looks incredible – love the POP of color Tieghan! This is seriously so cute with the peep toppings but I ADORE the inside! The colors are perfect and it’s a nice surprise! Love that there’s 6 layers, too! Mine would topple over cause I’m pretty much the worse cake-maker there is. Tieghan, this cake is B-A-N-A-N-A-S! What a thing of glory and so perfect for spring! And of course you’re right–pastel frosting was totally necessary for this gorgeous thing. 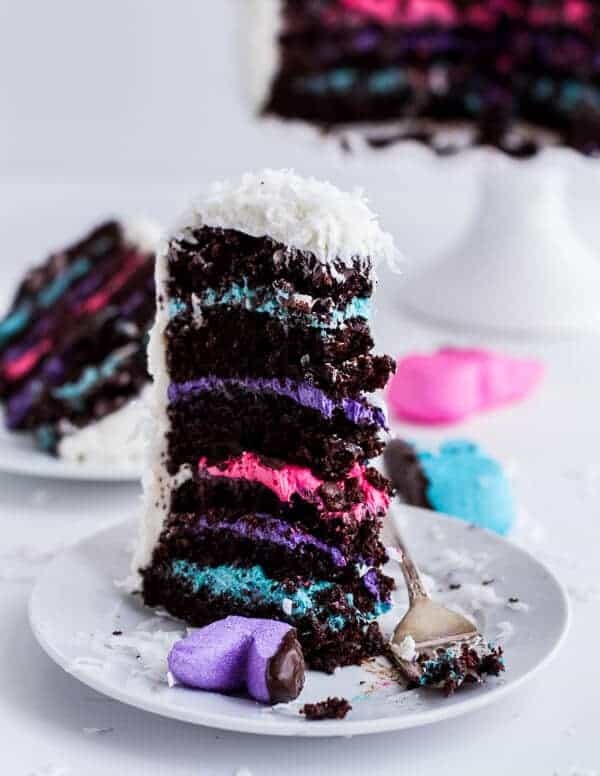 This cake is insane….it makes be gitty just looking at it..I love the different layers of colors and I believe marshmallow should be a food group so bring on those peeps…you’re genius!!!! I just love those chocolate covered peeps! 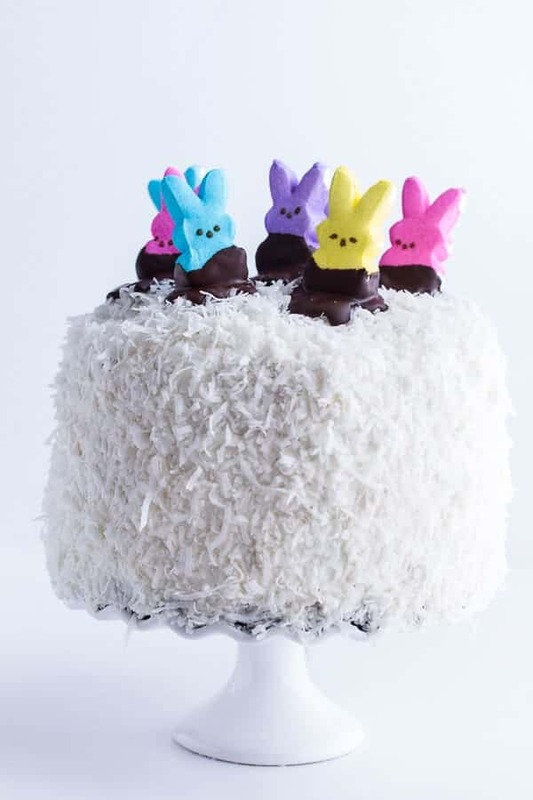 Peeps were my absolute favorite growing up and such a pretty cake. Tieghan, I don’t think this cake could GET anymore gorgeous!! 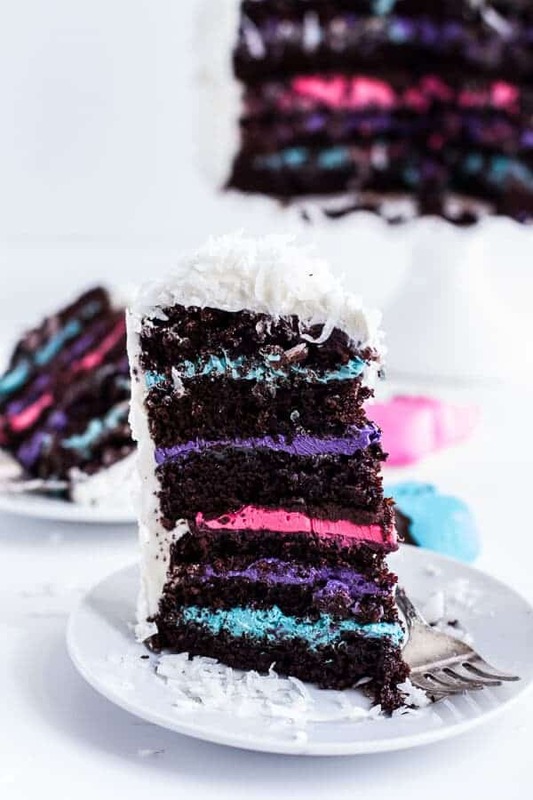 I love the tall slices and omg the pastel-tinted frosting in between the layers is so freaking genius! And I sympathize with you about the snow! We’re supposed to get an inch today….whaa?! This is beyond adorable! You are so crazy creative – love it! Thank you so much, Kelly! Hope you are having a great weekend! Whoa Granny! That is impressive. Like, I could never do that. I made a three-layer Banana cake once, and it was rough, and no where nearly as pretty as yours. One thing though, I’ve never liked the rabbit peeps. For me, peeps have always been the little chicks. Haha! No way, I searched high and low for the bunnies because they are my favorite. Too funny! Thanks! Wow, this cake is simply over the top amazing, Tieghan!! 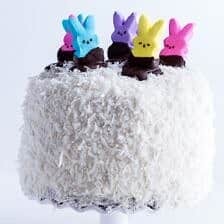 Love those chocolate covered Peeps on top! Holy awesome, Tieghan!!!! This is soooooo pretty! I’m almost tempted to can the cupcakes I’m making and make THIS instead!!! Thanks so much, Ashley!! But make those cupcakes, I know they will be awesome! This cake looks awesome!! Love this! lol adorable cake! 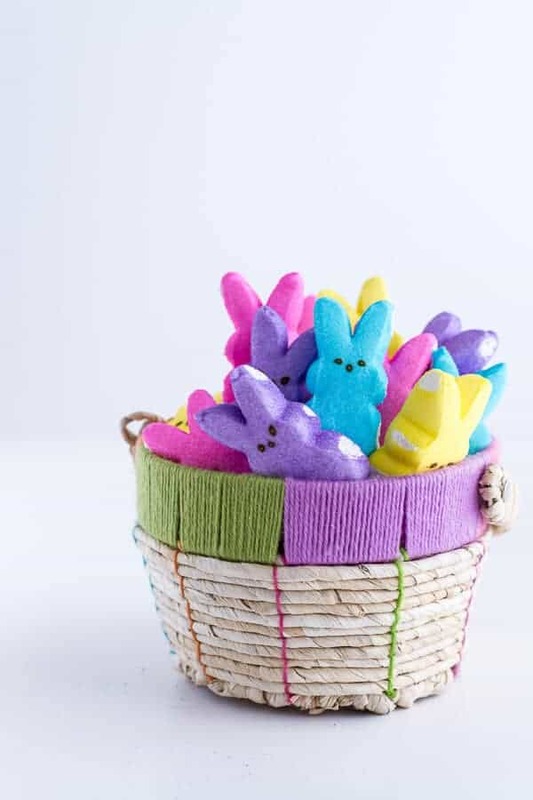 I’m not a peep fan either but around Easter they just make me smile! and isn’t cutting the “perfect” piece of cake for photos the worst thing ever? way too much pressure, and it’s never quite the way you want. haha. but yours looks wonderful! I’m speechless, this cake look amazing! So adorable! I’m impressed that anyone can make a six layer cake, let alone get a piece of it to stand up for a photo. Perfection is overrated anyway, especially when it comes to cakes 🙂 We’ve all seen those perfect-looking cakes that turn out to be dry and flavorless inside – so not worth it! This one looks absolutely delicious! 6 layers?!? You are so gangster! This cake is just amazing!!! I love the topping they are just too cute for words! If you are ever going to break the rules, this cake is the perfect place to start. Love it! Thank you!! I am still wary of the colored frosting (not my thing), but it was fun! I like the icing to cake ratio :). Perfect for spring and Easter! I was so surprised to see so many layers inside this cake. Lovely! I think it turned out gorgeous! Your cake looks beautiful! I love the vibrantly colored frosting. These are ADORABLE with a capital ‘A’. Watch out, Cake Boss! I’m so glad you broke your rule about no food coloring for this gorgeous cake! It is quite a beauty! This looks amazing! And don’t worry about “the perfect slice”. 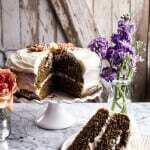 Food stylists and photographers would have gone with a dense, un-tasty, cake that made even slices, touched up the slices with extra frosting piped on the sides, etc, etc. Not to mention photoshop! Aww! Thanks so much, Alexandra! 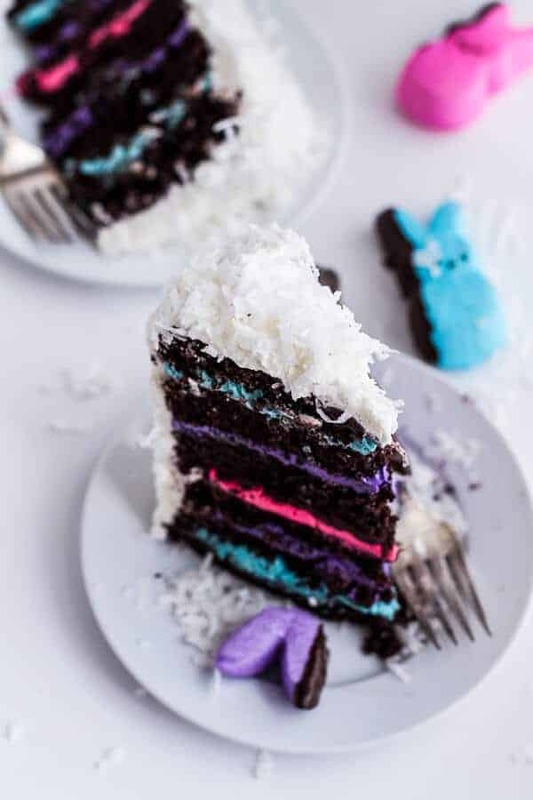 This is not a cake, Its EVIL, dipped in frosting and rolled in coconut… Great disguise tho lol… One day when I am big I will attempt something as extravagant as this. How much butter is required in the ganache? 2 tablespoons. Enjoy the cake and Happy Easter! The cake is gorgeous! And those spoons – Adorable! Thank you for such fabulous cuteness, looks yummy! I love this idea and can’t wait to try it out as a surprise for my class on graduation! Is there any alternatives I can use to replace the coconut shavings? What frosting would you recommend I use to frost the cake or should I just used the ganache for the outside? Is there any frosting ideas you have since my school isn’t air conditioned and I need a really strong frosting that won’t melt and won’t feel too rich to the already hearty and yummy cake! Hi Liv! I think that any buttercream frosting or just ganache would work. maybe a vanilla buttercream? I have a question on the ganache. Your instructions state butter, but the ingredients do not have butter listed. Can you verify? So sorry, the butter is a typo! No butter is needed for the ganache. Let me know if you have questions. Hope you love the cake and happy Easter!